Let us assume that after reading my previous post 'A case against active investing' (part - 1 & part - 2), you have decided to make the move from investing in active mutual fund, which often charge high fees, to low-cost diversified index funds to improve your long term returns. In this post, I am going to highlight some of things to consider before you go ahead and start investing in index funds. The beauty of investing in index funds is that is straight forward and requires very little maintenance, freeing up your time to focus on other things in life. This, however, does not mean that there are no 'active' (conscious) decisions to make. It is important to put serious thought into your asset allocation (portfolio construction). You can choose to invest in several asset classes, like, stocks, bonds or gold or cash to name a few. You will need to take several factors into account, like your age & risk tolerance, among other things to arrive at an optimum mix (between stocks, bonds or gold) based on your individual circumstances. Personally, I am not a fan of financial advisors but, you might want to speak to one. In terms of performance, historically, stocks have outperformed all other asset classes. But, stocks also carry higher risk when compared to other asset classes and can be quite a ride. (Note: This is in line with capital asset pricing model (CAPM) - the return you expect from an asset is related to the risk of holding it when markets fall). Stocks are relatively predictable over long period of time but, they can fluctuate widely (up and down) in the short-term. For this reason, regardless of the mix you choose, please do not invest any money into stocks that you will need in next 2-3 years. Vanguard Australian Shares Index ETF with an expense ratio of .12% p.a. for S&P/ASX 300. Vanguard US Total Market Shares Index ETF with an expense ratio of .05% p.a. for US market. Vanguard All-World ex-US Shares Index ETF with an expense ratio of .15% p.a. for all world ex-US market. Another decision you would need to make is whether to invest in lump sum or dollar cost averaging (DCF). The evidence against lump sum or dollar cost averaging (DCF) is mixed, with some research suggesting DCF and others lump sum investment. Then, once a year rebalance your portfolio to bring it back to re-align it with your tolerance of risk (predetermined mix of asset classes). Note: Personally, I am in my late 20s and fully invested in VTS.AX and hold no bonds. Between 1971 to 2015, the market has gone by 75 folds beating every other asset class. A sum of $10,000 invested in 1971, would be worth $759,000 in 2015. This spectacular growth would have been anything but a smooth ride as shown in the graph below. Chart: Showing growth of $10,000 invest at the start of 1971. During extended period of rising (bull) markets, when everybody around is touting about how much money they have made in last few months, there is a dangerous tendency to feel left behind. This usually results in investors playing catch-up for the lost ground by pouring money into markets to make a quick buck. In other words, equities are bought with the hope to sell them at a higher price to somebody else without any regard to fundamentals. Inevitably, reality strikes and the speculation party comes to an abrupt end. Studies show that people feel the pain of loss twice as much as they feel pleasure from an equal gain. It is no wonder, then, when this happens, investors react with even greater vengeance and desperately try to limit their 'losses'. As silly (and irrational) as it sounds, this behaviour is all too common! And even professionals fall prey to it. We do not have to look too far behind to see that investors exhibited this behaviour during the dot-com bubble and more recently, during the housing bubble of 2007. This is evident from the fact that the total amount of money flowing into the stock market maxed in Jan 2000 coinciding with the market top (see chart). When the bubble burst, investors started fleeing (taking money out) the market. This trend continued until the markets hit the bottom in 2003 and investor who had bailed out missed the rebound. Six years later, history repeated itself (GFC)! Nobody explains it better that John Bogle, 'Why in the name of peace, do we pay any attention to the stock market? The stock market is a derivative of earnings power and dividend yields of the corporations. The dividend yield plus the earnings growth that follows is what creates the fundamental returns on stocks. And the speculative returns on stock, compared to that of investment return is how much are people willing to pay for a dollar of earnings and that carries the market up and down. 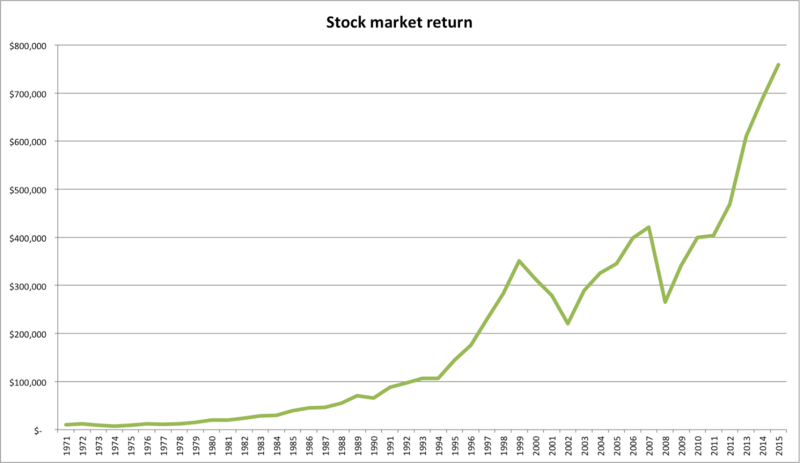 In the long run, in the last 100 years, the contribution of speculative returns to the total market return is zero. And the contribution of investment return, we have had 4.5% dividend yield and 4.5% earnings growth, that's the 9% you read about in the US market. The stock market is a giant distraction to the business of investing". When value of your portfolio goes down by 40% or more (as it did on 3 separate occasions between 1971 and 2015), it can be difficult to hold onto your nerves. But always remember - it's perfectly normal for the markets to go up and down. Ignore the media and tune out the noise! Do not panic and stay invested because the long-term can be very rewarding, if only, you stay the course! Like always would love to hear stories from my readers!